Above is my sketch based upon our existing Vetter -Rifle streamlined body kit. 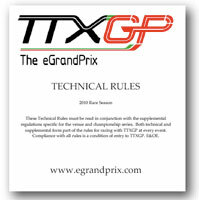 I believe it is in compliance with the 2010 FIM TTXGP rules... really streamlined. How often have you heard me complain about how 50 years ago the FIM banned real streamlining from the tracks of the world? In 2008, I decided to stop complaining and see if I could change things. 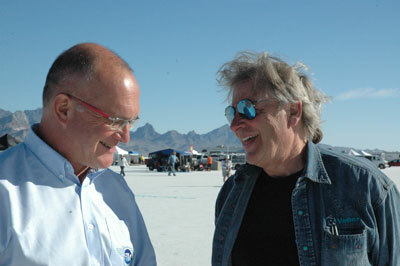 Charlie Hennekam of the FIM agreed to meet me at BUB Speed Week, 2008 and discuss the situation. To my surprise, Charlie encouraged me to present my case for streamlining. I sent him this PowerPoint show. 2008: My 4 minute .mov "Argument for Streamlining"
"My work on tails has shown that there has been no detrimental effect to handling with a tail in highway conditions up to 75 mph, into 35 mph winds. At Bonneville where speeds are greater, the tails get longer. I do not see why FF machines are seen as acting differently than “standard” motorcycles. Therefore, simplify and standardize rules for FF and other configurations while making it easy to determine if the machine meets specs. My suggestions are c,i, j, k & l below. The streamlining of solo machines must correspond to the following specifications. Feet forward configurations within the criteria listed below are permitted. a. Air foils or spoilers may only be fitted when they are an integral part of the fairing or seat. They must not exceed the width of the fairing nor the height of the handlebar. Sharp edges must be rounded off with a minimum radius of 8mm. b. Any part of the streamlining which faces rearwards must be finished with round edges of 3.5mm minimum radius. c. Was: The rider must be completely visible from either side, except for the riders hands and forearms which may be obscured by bodywork. The depth of the seat base can be as deep as the seat hump permitted on a motorcycle (150mm) and the riders hips may be obscured to that extent. c. Proposed by Vetter: The rider must be completely visible from either side, except for the rider’s hands and forearms which may be obscured by bodywork. d. The front inclination where the number plate is fixed must not exceed an angle of 30 degrees to the rear of vertical. e. The ground clearance when loaded must not be less than 100mm. f. No part of the bodywork may come into contact with the ground when driven at normal racing speeds. g. Bodywork must not exceed 1000mm in width at any point. h. Bodywork must not protrude more than 50mm in front of the front wheel. i. Was: Bodywork must not protrude more than 200mm beyond the rear wheel. i proposed by Vetter: I see no reason for any such limitation. I would like to gradually increase this overhang but I am aware that you don’t want tails. Could we double this length to 400? I am confident that there is no down side. The bikes will simply go faster. j. Was: The maximum height of the back of the rider’s seat is 150mm. This will be measured from the lowest point of the rigid base of the seat to the uppermost part of the fairing behind the rider. For feet forward configurations bodywork behind the rider must not be higher than the rider’s helmeted head. 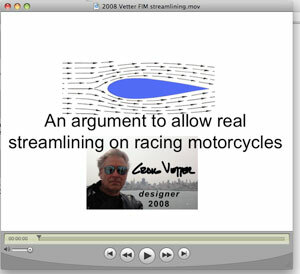 J. proposed by Vetter: The maximum height of the back of the rider’s streamlining bodywork must not be higher than the rider’s helmeted head in “at speed” racing position. k. Was: Bodywork in front of the rider must not be higher than the rider’s shoulders. l. Was: Total side area behind the rider must be at least 20% greater than the total side area in front of the rider. m. Mirrors, if fitted, must be shatterproof and fold back without damage when the vehicle is one side. The mirrors must retain the normal configuration when the vehicle is upright. o. The minimum width of the handlebars is 450mm." Guess what? We got everything I asked for! 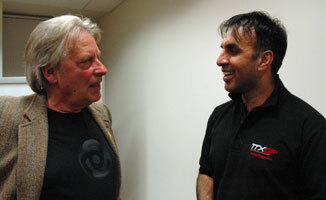 From Charlie Hennekam, Nov 3, 2009: "Hello Craig: For your info, the CTI (the FIM International Technical Panel) have reviewed the technical rules for electric powered vehicles, in cooperation with Azhar Hussain and Simon Maddison (TTXGP). But the new section includes the use of complete streamlining, on solo motorcycles or scooter type (feet forward) 2 wheel vehicles." I am happy... the TTXGP folks are happy. This is a major decision by the FIM. It will affect how electric motorcycles look on the track and on the road. It will go a long way to save energy. But for now, it covers only electric bikes. I suspect that we will be watched carefully to see how we handle our new found freedoms. We still need to be working to get real streamlining on all racing machines. Designers and engineers of the world: This is our opportunity to solve the problems that worried the FIM so many years ago, leading to the outright ban on streamliners. Today streamlining is being allowed on electric machines because there is no organization of electric manufacturers with a "status quo" industry to protect. It is all new. The electric folks I know want streamlining because they understand that their batteries will take them farther and faster with streamlining. The big lesson here is that the FIM is willing to change. For that, I am grateful and encouraged. Isn't offering to help better than complaining? Note: it's the same, Norton Featherbed frame. His answer was that the dustbin fairing was not allowed, because the bodywork extended more than 50mm in front of the front wheel. My question to you is, can we increase that number from 50mm to something larger that would accommodate the longer fairing? With an eye on safety, what is the maximum that the "in front of the front tire" number could be? Thanks for any help you can provide, and, as always, if you want to discuss this on the Wiki instead of here, feel free to go to this page. Royce replied: Two things here. First, and probably most important, this dustbin fairing exhibits a lack of understanding of the importance of tails. It's taking off from exactly where dustbins were banned back in the fifties. In view of the discussion on the subject of safety, streamlining and tails already on the site, and 'rule 12' ("Where the front wheel is enclosed, the rear wheel must also be enclosed"), as a scrutineer I would have failed it as a potential safety hazard. Get a tail on the thing! I am disapointed by the lack of aerodynamic innovation demonstrated so far. Then there's the matter of the frontal bodywork protrusion beyond the front wheel. There's certainly some margin for amendement, 50mm is certainly conservative. At some point, assuming bodywork balanced by a tail etc., there will be enough protrusion to move the effective centre of pressure far enough forward to cause noticable disturbance. But I don't know where that point is. It depends to some extent on the shape of the bodywork of course. While it may be safe to extend the frontal protrusion of bodywork beyond the present 50mm, designers should be aware that they are entering territory where directional stability may be compromised in gusting sidewinds. It would be prudent to extend this limit gradually, perhaps at first to 100mm, so that experience can be gained while minimising risk. This comment applies Only to bodyshapes that include a tail in accordance with rule 12. I do not believe 'dustbin' fairings that enclose the front wheel and extend forward of it, should be permitted without balancing tail bodywork. Craig comments: I agree with Royce about the importance of a tail. We need the tail. That said, I think streamlining works best on bikes with low seating positions. My KLR seat puts me way up there. Side winds like to push it around. The seat on the Helix based streamliner is 10" lower than the KLR! Low seat means smaller frontal area. Lower, smaller frontal area means smaller, lower side area for the wind to work on. The only reason the frontal area is still really big on the streamliner is beause I want to sit in a comfortable position. Racers don't care about comfort. Racers want to reduce their frontal even more, to go faster, further reducing the effects if sidewinds. The nose is responsible for "feeling" the blustery sidewinds more, not the tail. But we need the nose. The nose protects the rider from wind, bugs, cold and rain. The nose is the first portion of the true streamlined shape. For years the FIM has required that the rider be seen from the side. I never understood why until I covered the sides over. The gap for the rider turns out to be a pretty good idea. It allows side winds to blow thru the machine instead of "rocking the boat." I know this from personal experience. My only guidelines would be that the nose be as short and low as reasonable. Whether it is 2" or 4" is not important as far as I can tell. I am not saying that these guidelines eliminate all unwanted effects of blustery sidewinds. But Royce and I are giving you the basics for uasble streamlining. * There is more to this story. If the manufacturers had put real streamlining on their motorcycles, they would have had to reduce engine size because their bikes would have been going so much faster. It is generally understood by us in the motorcycle industry that building a 600 cc machine does not cost much more than building a 125cc. Since manufacturers can ask so much more for the bigger machine, they make more money with them. Thus their reluctance to want streamlining. In fact overall, producing efficient motorcycles, "Doing more with less," generally does not make people more money. Where have you heard that before? Loving the extra profits that come with bigger bikes certainly has been responsible for burning more fuel. I think we can all agree that consuming more fuel than we need to has not been a good thing.